If you can stomach the eye-watering price and you don't mind going without the traditional complement of ports, the new MacBook Pro is one of the best laptops money can buy. Speed, power and razor-sharp design sensibilities make it an absolute delight to use. If you are a user who needs a decent amount of power but you are baulking at the price of the 15-inch MacBook Pro the 13-inch model may well suffice, and if you need a bigger screen you can just plug it into a separate display. 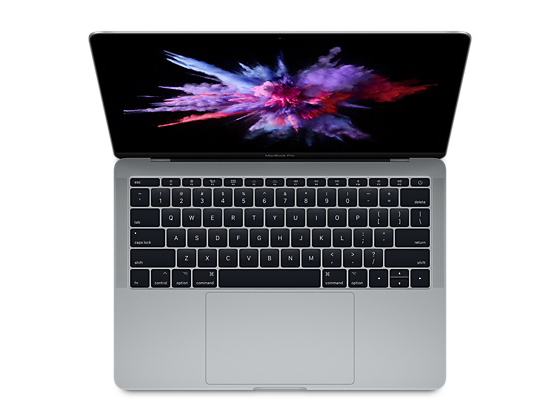 But if you are a creative pro looking for a powerful machine to match your graphics needs you aren’t going to find what you want in the 13-inch MacBook Pro. If you can live without top models' glitzy Touch Bar, you might get Apple's best laptop bargain, though you'll want to invest in a storage upgrade and USB-C adapters. With macOS High Sierra set to arrive later in the year and streamline performance even further, this absolute workhorse of a laptop will be able to handle anything you can throw at it today, and will still be ticking over years down the line. Positive: Compact size; nice display; comfortable keyboard; decent ergonomy; high autonomy. Negative: High price; no SD card reader. Model: The Apple MacBook Pro 13 2017 does not look any different to last year’s model. It has the same svelte, all-aluminium chassis that feels immensely sturdy, the same Space Grey or Silver color choices, and the same shiny Apple logo etched into the lid. At a little under 1.4 kg, it’s not so light that user won’t notice it sitting in a bag, but it won’t give back strain just lifting the thing either. It’s only 15 mm thick, which is significantly skinnier than the previous generation design. There are lighter and thinner laptops out there but few of them can match it in terms of power as well as portability. Also unchanged for 2017 is the lack of connectivity at the sides. Users are going to need to pick up some dongles, as they only get a grand total of two USB-C ports. They double up as Thunderbolt 3 ports, so are super-quick when user plug in a compatible bit of hardware, but all other old gear is will require some kind of adapter. The MacBook Pro’s 2.560 x 1.600 pixels are plenty. The 13.3-inch panel is absolutely bursting with detail. Photos and videos are bursting with detail, but it is color vibrancy and accuracy where the screen really stands out. It covers the wide DCI-P3 color gamut. It really shows, with brilliantly bright hues, crisp pure whites and deep, inky blacks all sharing screen time together. Graphics professionals will be more than happy with the complete sRGB coverage. Brightness is impressive as well. Apple says it can hit an eyeball-searing 500 nits, which enables users to work outdoors and still see everything on screen clearly. Essentially, Apple has made the jump to Intel’s 7th generation Kaby Lake processors, which squeeze a little more performance out of the silicon than last year’s Skylake CPUs, without sapping any extra electricity from the battery. The 8 GB of RAM and crazy quick 256 GB PCIe SSD help keep MacOS running to speed. For graphics, it features an integrated Intel Iris Plus 640 graphics unit, which are better suited to decoding 4K video. This chip is also capable of some light gaming. When it comes to getting work done, there is nothing quite like the MacBook Pro. It’s all down to the backlit keyboard, which uses Apple’s custom butterfly switch design. Each key has a minuscule 0.7 mm of travel, but needs more force than a regular keyboard to activate. This non-Touch Bar model has physical function keys, which might not be as fancy or futuristic, but they aren’t draining battery life just by sitting there, which is a bonus. Pick up a MacBook Pro today and it will arrive with MacOS 10.12 Sierra. Apple’s last big update landed in 2016 and added useful extras like Siri and Picture-in-Picture mode. It also gave users an excellent iCloud integration throughout the operating system, which is very handy for anyone with an iPhone or iPad. The Macbook Pro is already a solid choice for professional users. This update made it even better. The price may be quite steep but to many, this is not a reason not to get it. 7360U: Kaby-Lake based ULV-SoC (System on a Chip) for thin notebooks and Ultrabooks. Integrates two CPU cores clocked at 2.3-3.6 GHz as well as an Iris Plus Graphics 640 GPU clocked at 300 - 1000 MHz and 64 MB eDRAM. Manufactured in a 14nm process.» Further information can be found in our Comparison of Mobile Processsors.